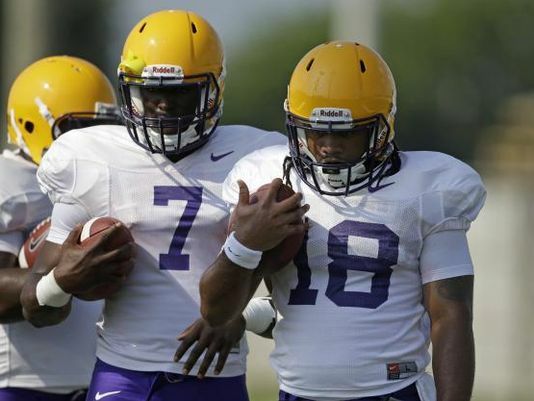 LSU football players wear the Vector Mouthguard. It’s no secret that football is a tough sport, with the possibility of injuries ever-present, including concussions, a type of traumatic brain injury that occurs when a head impact jars or rattles the brain inside the skull. In fact, a recent study from the National Center for Injury Prevention found that approximately 47 percent of high school football players say they suffered a concussion each season, with around 37 percent of those reporting multiple concussions in a year. But according to the American College of Sports Medicine, some 85 percent of sports-related concussions go undiagnosed. While it’s difficult to prevent concussions from occurring, even with a helmet, which is designed to protect the skull, not brain, there are some measures that can be taken to improve the safety of young athletes. First and foremost, only medical staff can diagnose a concussion, not a coach. Therefore, it’s paramount to have qualified doctors and trainers schooled in concussion safety present at games. The NYC Public School Athletic League requires medical personnel to be at every football game played during the season. In addition, as of July 2012, New York State mandated that all PSAL coaches, regardless of sport, must be certified in concussion management. This is vital because statistics indicate that roughly 33 percent of all sports concussions happen during practice. But it’s not economically feasible for high schools to have medical personnel at every practice. So it’s important for coaches to recognize the symptoms, which include loss of consciousness, drowsiness, confusion, headache, nausea or vomiting, blurred vision and loss of memory of events surrounding the injury. Moreover, medical experts believe that erring on the side of caution, plus have an accredited medical professional evaluate the athletes are the best course of actions to take. However, concussions are often difficult to identify and can impact athletes’ current and future health status. That’s were i1 Biometrics–a Kirkland, Washington-based cutting edge technology company focused on sports, military markets, and wearable tech–comes into play. i1 Biometrics has developed the Vector Mouthguard, a state-of-the-art mouthpiece that utilizes embedded microscopic technologies that accurately measure the impacts and accelerations a player’s brain experiences during play. The highly accurate data is then transmitted to sideline personnel, who use a computer or smartphone to measure every player’s head impact level, with individual thresholds, said Jesse Harper, President and CEO of i1 Biometrics. But he also believes it can lead to better coaching techniques that will hopefully prevent less head-on collisions, resulting in less head traumas. But i1 Biometrics isn’t the only one taken measures to reduce the severity of concussions, even incidents. In 2009, Washington State enacted the Zackery Lystedt Law, named after then-13-year-old middle school football player Zackery Lystedt, who collapsed from a traumatic brain injury when he was allowed back into a game just 15 minutes after suffering a concussion. Washington became the first state in the nation to pass a comprehensive youth sports concussion safety law. The law requires certain provisions be upheld in order to hit the field, including the prohibition of youth athletes suspected of sustaining a concussion from returning to play or practice without a licensed health-care provider’s approval. Lystedt spent the next nine months in a coma, and even today is still confined to a wheelchair. Presently, all 50 states have some form of youth sports concussion safety law in place. But the Lystedt family is taking it one step further, hoping to drive the law to the US Congress and make it federal one day.